The Union Square Christmas Tree Lighting Ceremony is one of the best ways to celebrate the holidays in San Francisco. After the official ceremony, the tree will stay lit each night for you to enjoy through the beginning of January. 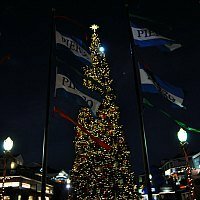 The tree lighting ceremony in Union Square is scheduled for Friday, November 23, 2018. 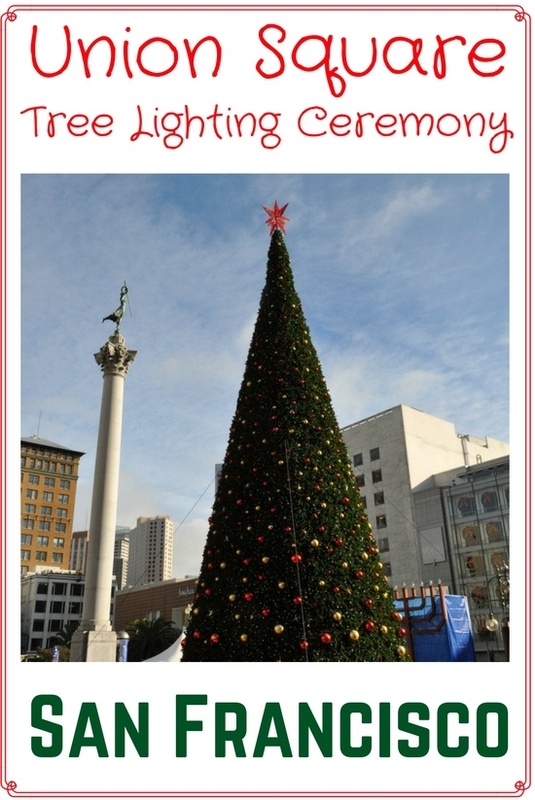 The Union Square Christmas Tree Lighting Ceremony is always held the day after Thanksgiving in San Francisco. The 2018 scheduled performers include several local performers and artists. The performances will be followed by the lighting of the tree at 6:40pm. Every year, the Christmas tree is given to the city as a gift from Macy's. This year's reusable tree is 83 feet tall and will feature more than 30,000 lights and around 1,100 decorations. After the official ceremony, the tree will be lit each night through the end of the year. Most people stay in Union Square during their visit to San Francisco. Here are a few top hotels to consider for your visit. The Union Square Christmas Tree Lighting Ceremony is a very popular event located in the hub of the tourist action, so make sure you get there well in advance to stake out a good spot. I recommend you arrive at least an hour early and make your way through the Post and Powell Street entrance (past the red heart with a picture of the Golden Gate Bridge) to the cement steps near the tree. They will be on your left once you enter the square. This is the perfect location to watch the ceremony, as you'll be close enough to admire the beautiful decorations, but still far enough away to see and snap photos of the whole tree lit up (remember, it's 83 feet tall!). 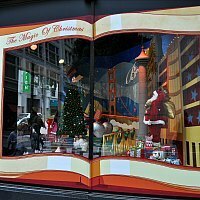 While in Union Square, don't skip the Macy's holiday window display on Stockton and O'Farrell Streets. Every year, San Franciscans look forward to greeting the heartwarming, adorable faces of real dogs and cats that make Macy's holiday decor come to life. All of the pets on display are up for adoption, and over the years, Macy's has given over 8,500 animals the gift of a new permanent home. 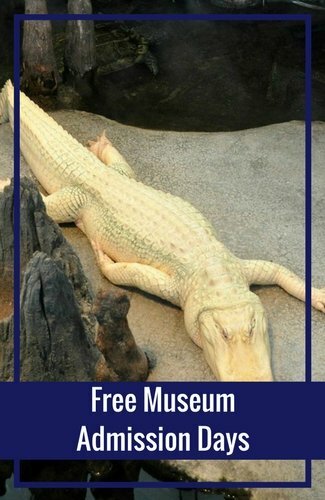 Stop by to watch them playing in the windows, and perhaps adopt one yourself. One of the best ways to enjoy the holidays is by catching a Christmas Show during your stay. You will find a variety of shows every year. Here are just a few scheduled for 2018. 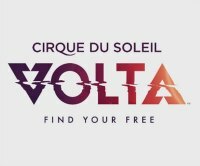 Cirque du Soleil: Runs from 11/16 - 1/6 Under the Big Chapiteau near Oracle Park (formerly AT&T Park), click here for more information and ticket availability for all dates. A Christmas Carol: The A.C.T. will once again show this popular show during the Christmas season. It runs from December 6 - 26. Find tickets at a discount on Goldstar. Nutcracker Ballet: SF was the first to show this now popular ballet performance within the US. 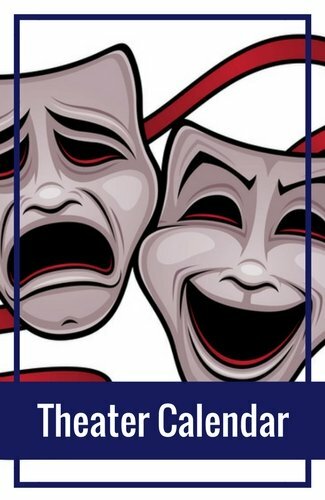 This year's shows run from 12/12 - 12/29 at the War Memorial Opera House in the Civic Center district. Learn more. Every year during the holidays, San Francisco's buildings, parks, bridges, and even boats are illuminated with beautiful displays of dazzling lights. But how can you be sure to see all the best lights around town? 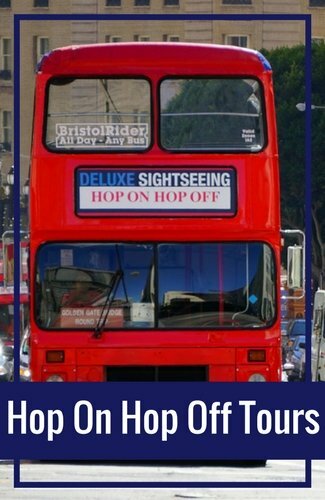 Just sit back, put your Santa hat on, and enjoy the sparkling scenery on one of these small-group night tours. 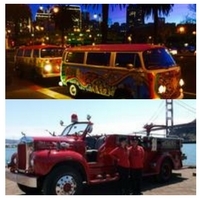 Choose between two fun options: riding on a shiny red fire engine, or in a 70s-style VW van. 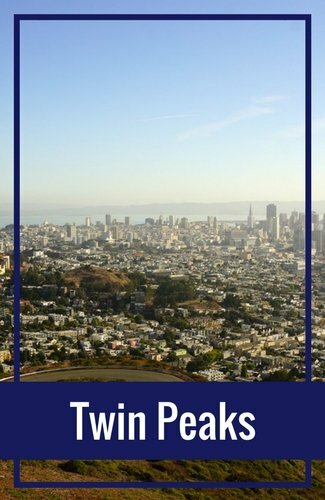 Both will take you all around town, beginning with the Christmas tree at Pier 39, along the waterfront of Fisherman's Wharf, to the Palace of Fine Arts, the Embarcadero, Lombard Street, Chinatown, and North Beach. From November 7 through January 21, you can ice skate right in the heart of Union Square. 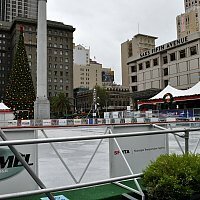 Take a refreshing break from your holiday shopping to glide on this outdoor rink in the middle of the plaza, surrounded by the Union Square Christmas tree and all the other holiday decor. Admission for a 90-minute session on the ice runs from $13 to $25 per person, and you can rent skates right on the spot. On the western side of the Union Square plaza, you can't miss the towering, historic Westin St. Francis Hotel. In the lobby during the holidays, you'll discover two incredibly ornate, lifelike sugar castles that invite you to delve into your imagination as you examine each perfectly handcrafted tower, room, window, tree, and elf climbing up to the top. 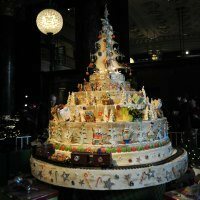 These impressive works of art by Chef Houdre require hundreds of pounds of sugar (one castle reaches 12 feet in height!) and countless hours of meticulous pulling, blowing, and shaping--a true confectionary marvel. In addition to the Union Square Christmas tree lighting, there are many more tree lighting ceremonies to enjoy all over San Francisco. 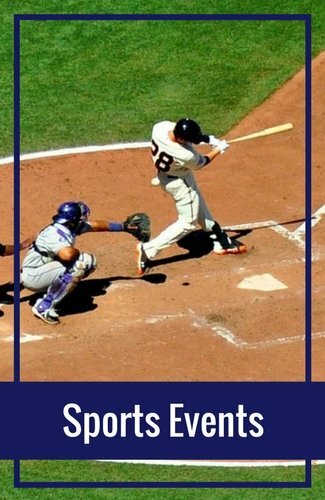 Some of the most popular locations include Pier 39, Ghirardelli Square, City Hall, and the Presidio. Each holiday display is unique, with different themes, entertainment, and refreshments. Dates for the lighting ceremonies vary from the last two weeks of November to the first week of December. Click the link below for more information. 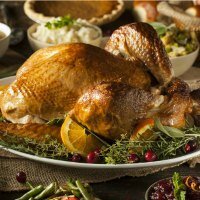 If you're going to be spending Thanksgiving in the city, you'll have lots of options for activities, shows to catch, delicious meals, and attractions that will still be open. One of my favorite things to do on Turkey Day in San Francisco is to take a cruise on the bay for an afternoon buffet or sunset appetizers. 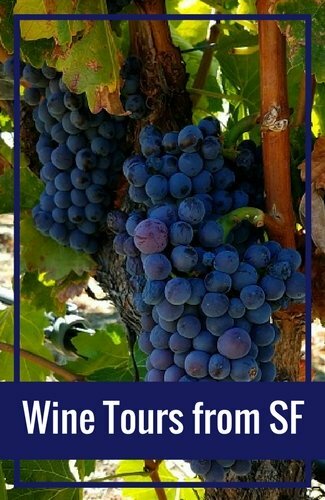 You could also head to the theater to watch a Broadway musical, a concert, or an SF Opera performance. Follow the link below to see a full list. Spend an extra special Christmas Eve and Day in San Francisco by attending a holiday performance of the The Nutcracker by the SF Ballet, Cirque du Soleil's Volta, or others. A number of the city's renowned restaurants are also offering special menus. 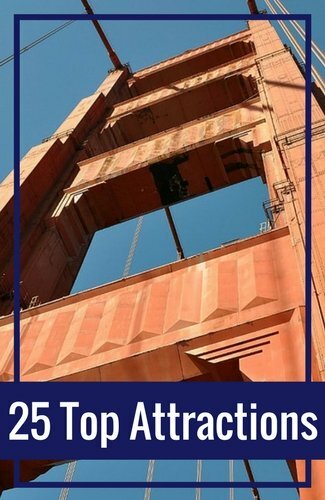 If you're looking to do some sightseeing, you'll find a number of attractions still open on the holiday, and you might even want to take a tour of the bay, the Golden Gate Bridge, or Chinatown. Get the details below. What would the holiday season be without visits from Santa Claus? 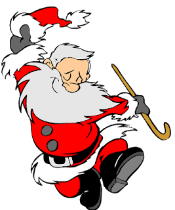 The jolly man in the big red suit makes lots of appearances all around town, beginning in late November. In addition to the Union Square Christmas tree lighting, you'll find Santa at Pier 39, the SF Zoo, hotels like the Ritz Carlton and the Fairmont, and at various malls. Check out the list in the link below for dates and times, and head over with your kids, cameras, and wish lists. 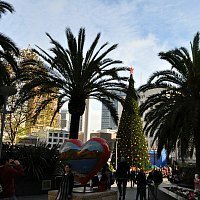 If you love getting into the holiday spirit and admiring all the different types of lights, trees, indoor and outdoor decorations, you will find plenty of festive spots all around San Francisco. 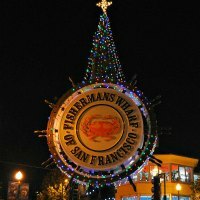 These include the lighted snowflakes along Market Street, the tree at Pier 39, the winter wonderland at the SF Zoo, and more. 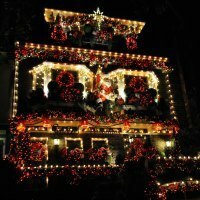 You could also attend a festival like the Union Street Fantasy of Lights, the Fisherman's Wharf Lighted Boat Parade, and the Parol Lantern Festival and Parade. Find out how to get to these outstanding displays.